Some years ago I found this copy of a 1902 Sears, Roebuck & Co. Catalogue No. 112 at an onsite estate auction. Which I purchased with the thought of featuring the antique furniture descriptions and images on this website. While the catalog is far from being in great condition most of the product pages are still fine for scanning purposes. Best I remember this vintage 1902 Sears, Roebuck & Co. Catalogue cost me in the $30 range? A true bargain considering the prices that I see asked for original 1902 Sears, Roebuck & Co. catalogs listed for sale online today! So when was this 1902 Sears, Roebuck & Co. Catalogue No. 112 actually printed? On first thought it would seem pretty easy to date the catalog! Just look for a date somewhere inside the catalog cover. However I haven't found anywhere that lists the actual year it was published. Looking online I did find that Sears, Roebuck & Co. Catalogue No. 112 was used during 1902 and 1903. In the first part of the catalog under ordering information the banking references given are both dated 1901. On page 598 of the catalog, product No. 1T790 is listed as "Our $5.95 Solid Golden Oak 1902 Cupboard" and descibed as "This Handsome New Style Oak Cupboard is the very latest design for 1902". Which is where I first came to the conclusion that my catalog was from the year 1902. However as I looked closer at the furniture related products. I noticed that on page 181 and 182 the organs pictured "46T40" and "46T56" are listed as "our New 1903" and "Our 1903 Design". Checking more closely under the ordering information the example order blank shown is dated Nov. 7th, 1902. A clue to someone with more knowledge than I is that this Sears Roebuck catalog features 1200 pages. Results I got when searching Google Books for 1903 Sears, Roebuck & Co. Catalogue 112 show a catalog with 1088 pages and the publisher is listed as Sears, Roebuck, 1902. Google also lists a 1903 Sears, Roebuck and Co. Catalog No. 113 with 1150 pages. The only 1200 page catalogs I can find listed listed are all from 1902. I didn't find any mention of the 1902 catalog online at Sears Archives. However Sears Archives states that "The 1903 catalog included the commitment "Your money back if you are not satisfied," and Richard Sears added a handwritten note to his customers." My catalog doesn't appear to have the the hand written note. Instead it features a typed letter inside the front cover. There is mention that any goods ordered that are not perfectly satisfactory may be returned at Sears, Roebuck's expense and that the customers will receive a refund. So at this point it would appear that this Sears, Roebuck & Co. Catalogue No. 112 was published late in 1902? 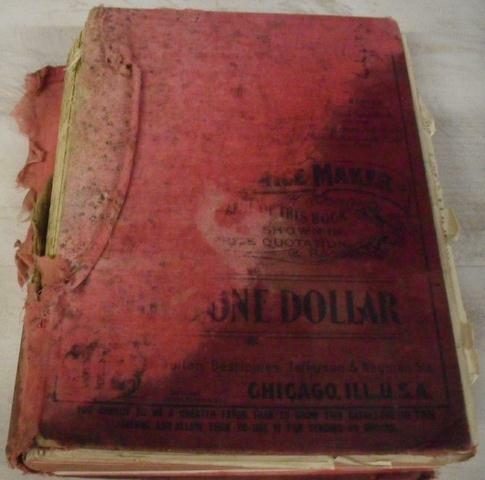 While searching online I found mention that by 1902 Sears, Roebuck & Co. were printing their product catalogs in house. Which allowed them the ability to improve on the quality of the images featured in their catalog. According to the catalog intro page there are over 100,000 illustrations featured in this catalog. I hope to feature as many of the antique furniture images and associated descriptions as possible when time allows. Plus some of the other unique and interesting products from the early 1900's that we now refer to as antiques and primitives. Which are often sold online or at live antique auctions. At the time I bought this catalog I wasn't aware that OCR software existed. However the use of OCR software has made archiving the Sears, Roebuck Co. product descriptions much easier than what I expected when I first purchased this catalog. I am using an Epson Perfection V330 Photo Scanner for this task. While the scanner is probably several years old by now? After spending a few hours of trial and error on setup I am pretty happy with the results that I am acheiving! I considered updating my OCR software to ABBYY FineReader 11 Professional. However at this time I am still using the ABBYY FineReader 9 that came free with my Epson scanner. I am scanning using the black & white setting on the Epson V330 scanner set at 600 DPI. While this setting results in images without as much detail as grayscale or the color setting. The black and white scanner setting allows for simple cropping of the images without the background color of the aged catalog paper showing in the image. After the images are scanned I batch resize them using VSO Image Resizer. As many of the images in the catalog are rather small. I chose to scan using the 600 DPI setting which allows for increasing the image size for uniform display without losing too much image quality. The OCR software does a pretty good job with the catalog descriptions. However certain print characters in the catalog do produce weird results. So I proof read the catalog text descriptions before adding them to the database. Hopefully finding and editing out most of the OCR mistakes! I spent several days searching for software to display each of these chosen products listed in my 1902 Sears, Roebuck catalog. Checking out shopping cart software and photo album software. I was quite surprised that there weren't more basic PHP catalog software/scripts available online for simply displaying products! Software with the ability to feature the product image and add a description to a MySQL database plus be search engine friendly. I found a couple php scripts that pretty much would have done what I wanted. However in the end I decided to use the PHP photo gallery software I had written to display my antique furniture photos. Over the many years I have been building websites I had avoided learning to write PHP scripts that used a MySQL database! Well after a crash course on databases and several loooong days I have added a MySQL data base to my PHP photo album software. The result is a PHP script that displays the Sears, Roebuck catalog images and descriptions on individual pages. Is search engine friendly, matches the simple layout and style of this website and has a random image feature. In the future I will probably add a search function and display the latest images uploaded.